A recent Nielsen report confirmed that I’m far from alone in what I’ve found myself doing whenever I watch television. It is one thing that 57% of smartphone and tablet users check e-mail, while according to Nielsen, 44% surf for unrelated info and the same percentage visit social networking sites during TV programs. Even more chilling for advertisers is the finding that during commercials nearly 60% check e-mail, 44% surf for unrelated information and a similar percentage visit social networking sites. To put those percentages in perspective, as of last fall, the number of smartphone users reached 95.8 million or 44% of US mobile subscribers. They might be called smartphones but a new study reveals that only 5% of their use is as a telephone even though it's just been 10 years since the first model provided web access. A little more than 12 months after the first tablet was launched there were already more than 15 million users. It is forecast that in a little over three years from now 65% of Americans will have smartphones or tablets. Significantly, 70% of tablet use is home where 39% use it for news and 34% for sports. All of this has to be extremely troubling for people who make their living working in television. When I get the opportunity to carefully listen to friends and associates who work in the various media that provide news and information, I find the sense of quiet frustration if not desperation is palpable. It isn't easy to sustain one paradigm while shifting to another, especially when neither the path nor the ultimate outcome is at all clear and so many human lives and jobs are at stake. And the courage it takes to break up a paradigm is often thwarted by the reality of sunken capital costs and worried investors. I don't know if it's bravado or just being frozen by the trauma they have been witnessing for some time no by traditional daily print newspapers, but many of the very smart people working in television seem much less worried than it seems they should be. While the obnoxious barrage of negative and deliberately misleading television ads now being visited on Republican primary states is probably a windfall for many television networks and outlets, when it thrust upon the nation as a whole later this year during the run up to the general election it is bound to accelerate the trend of tuning out commercials. For decades now, the effectiveness of the advertising element of the marketing mix has seen a dramatic decline. It is now in the negative numbers for all but a handful of huge national categories of advertisers. It has also been shown to be ineffective for political campaigns except to line the pockets of consultants and those who produce and televise the commercials. Will it only be a matter of time until the number of channels begin to collapse or will we see a few excel while the content of most becomes very sent and repetitive and increasingly trivial until they begin to collapse? Will editorial television news become driven so much by the need for ratings that critical details are withheld, blurred or buried in order to extend these stories’ lifecycle? Will the number of programs decline to the point where reruns and reruns of reruns predominate and new programming is dominated by clones and clones of clones? Will staffing for television news be trimmed so thin that like radio they begin to merely interview each other as sources? Will watching television for news and information become annoying because the delivery seems so incredibly slow and the stories seem so repetitive or a day or more old by the time they are aired? Oh yes, come to think of it, these conditions are already occurring and in the immortal words of Charles Hardin Holly – “we fade away". Beatification efforts only when layered on vigilant cleanup routines will extend their effectiveness and provide an inoculation against carelessness including littering. They also inspire and beget diligence from agencies at other levels of government. Involving volunteers in community clean up can be a great way to get by-in and to create or deepen shared values, but far too many communities use these episodic events as a substitute for what should be sustained day-to-day baseline maintenance of a community’s trails, public areas, roadsides and medians. It should be both/and, never either/or. Even worse is that some communities seem to often view volunteer efforts as an excuse to divert funds from day-to-day routine maintenance or as a means to compensate for failure to put a light under uninspired bureaucrats. It should be both/and, never either/or. Volunteers, even in places such as Durham, North Carolina where they seem almost temporally embedded in the community’s DNA, should never be taken for granted. But only in very small towns is volunteer effort truly scalable and sustainable as a means to serve community-wide needs. Durham where I live is struggling with the issue of cleanup vs. beautification. Among many transcendent superlatives, roadside appearance is the only area to which residents give a failing grades, one for general cleanup and day-to-day maintenance and the other for roadside directional signs. Officials appear to often misinterpret the negative scores only in terms of “beautification.” Photo op anyone? Drew Cummings, a young Assistant County Manager for Special Projects and perhaps the best public administrator I’ve ever known (and I’ve known and worked with hundreds and many of the best during my now-concluded 40-year career in community-visitor-related economic development) took a much more in-depth look at 25 different roadside stretches and interchanges referred to as gateways. As part the Durham Appearance Advocacy Group (DAAG,) a gap-closing team of appearance activists and organizations along with appearance-related local agencies, Drew teamed with City staff and methodically indexed these “gateway” areas according to miles and acreage as well as status of deterioration and difficulty of terrain and estimated that, collectively, it could require as much as half a million dollars or more to reverse the effects of neglect and restore them to a status sufficient to support beautification. For safety reasons volunteers are not an option to do the work, but this doesn’t mean volunteers can’t oversee the work. In my opinion, local, neighborhood direction and oversight of clean up and beautification efforts through “Neighborhood Improvement Districts” (NIDs), makes just as much or more sense as the more common “Business Improvement Districts” or BIDs, especially if established and governed by “popular vote” of all those living and doing business within the district boundaries including both renters and homeowners as well as business building owners and tenants. Controversy over BIDs, including one proposed for Downtown Durham is usually more about the lack of a popular vote and how it will be governed than it is about the creation of the BID itself. To me it seems that a vote by secret ballot is essential and a “no-brainer” regardless of whether or not it is required or not by law. Public hearings are no substitute. Each NID could also be granted, upon majority vote, the right to request the levy of a special assessment to augment and amplify services such as cleanup and beautification above and beyond the base services provided community-wide but never as a substitute. Unfortunately, NIDs and local neighborhood oversight may be the only means to prevent cities and counties from becoming blinded to neglect and to the overall importance of community appearance and its overarching relationship to property values/tax base, public health, crime prevention, economic and workforce development, solid waste reduction, education, facility maintenance and to the quality of water, air and life. To adapt the words of semantic researcher Dr. Frank Luntz - NIDs could very well be a paradigm-breaking, game-changing breakthrough for community appearance! I’ve been blogging for about eight or nine years now, dating back to before the term was added to the Merriam-Webster Dictionary and well before what is now Facebook was first launched on the Harvard campus. There were already about 20 million, or so, blogs back when I started to blog, about three or four years after the term had first been coined, so I’m certainly no pioneer. Today there are nearly twice that number on Blogger alone, which is the platform I use, and as of last month, there were 173 million in existence, if you toss in the mini-blogs, Facebook and Twitter. When I first began to post blogs it was once a month or so, usually adapting or elaborating upon something I had written for the newsletter published by the organization where I worked until retirement a few years ago. By the time I rebranded as “Bull City Mutterings” midway through 2005 I was posting an average of one every other day, sometimes less. Readership, although never my objective, had grown to 500 a month about the average per daily post today before they are occasionally picked up and reposted by aggregators. In retirement I indulge a wide range number of passions including many that are personal and many that were part of my lifelong career in community-destination marketing such as reading, research and the study and adaptation of best practices -- only I do it solely for pleasure today. The eclectic mix of my posts reflects my interests and often my passions. People ask me what I typically do everyday and it varies. Sometimes it involves spontaneous motorcycle rides or cross country trips or photography or family history or volunteer work, but it always involves quality time with my constant companion, Mugsy an English Bulldog, dinner with close friends and connecting with family -- most frequently with my daughter who is an incredible single mom, a healthcare attorney and my only child. But I also spend an average of 5 to 6 hours a day including weekends with the research and distillation of essays some of which become blog posts but all of which are for the pure joy and excitement of learning new things, forming ideas and writing. I'm always amazed that the readership of my blogs is so diverse geographically, including many foreign countries, and that the majority are often new readers. I'm always grateful when I learn that a post has been useful to someone, especially young people but I hope it's never offensive that my only reason for writing these essays is the pure joy of it. For the full info graphic report from Nielsen on digital access including INCITE’s trendline for the number of blogs click here. To read the related article click here. Durham North Carolina's tiny 8-member Rapid Response Impact Team is the hidden force behind much of what is often credited only to neighborhood associations or organizations like Keep Durham Beautiful. Removing nearly 9000 instances of graffiti and related symbols and scripted words. Removing 324 displaced shopping carts that had been driven away from the sites where they belong only to be abandoned and left to junk up roadsides and trails. Removing more than 1100 illegal dump sites created by people, both residents and nonresidents who travel to Durham to work, who couldn't be troubled to properly dispose of the refuse. Mowing 344 ‘weedy lots” and cleaning up debris from another 243 sites, nearly 746 tons in all. In addition, the Impact Team facilitates individual neighborhood cleanup initiatives such as “big sweep” efforts focused on waterways as well as cleanup preparation for, urban gardens, clearing neglected right-of-ways, and dealing with costly-to-remove up huge bills such as paint and hydraulic fluids spills. The Impact Team is also most likely the group that quietly distributes and retrieves barricades for parades, fundraising walks and runs, festivals and other community events. They also supervise a team of two dozen young people over the summer it picked up 9 tons of litter in just eight weeks. Given the fact that Durham residents gave only two failing grades to their community, including one for inattention to general appearance, the Impact Team’s remarkable effort is one area not yet scaled to the size of the task it faces. This remarkable group doesn't get the attention it should because to do so would be to draw attention to neglect and raise questions about why community appearance is given such high priority among residents, but receives far too little attention from those in governance. Residents who mount volunteer cleanup efforts in neighborhoods and along streams and trails or spy graffiti or illegal dumping or weedy lots or debris that are threatening the community’s well-being, including public health and safety, should call or e-mail Durham One Call for assistance but it is likely the Rapid Response Impact Team that they will thank in the end. When Durham, North Carolina, where I live, is ready to mainstream the collection of electronics in residential curbside recycling, it won't have to go far to find business partners. While stopgap events collect and recycle 75 tons of electronics a year, a North Carolina facility based here in the “Bull City” already processes 240,000 times that amount collected from across the state every year. You’ve probably heard of “reverse recycling.” Now there is “reverse supply chaining.” Reverse recycling is where businesses or government agencies or nonprofits move from using large receptacles for waste and small receptacles for recycling to using the larger containers for recycling and the smaller containers for things that can't yet be recycled. GEEP (Global Electric Electronic Processing) is in the business of providing reverse supply chain solutions a.k.a. reverse logistics. While it is truly global, one of its three facilities in the United States is located here in Durham. The facility here is the only GEEP US location equipped to conduct both the ERPI process for shredding and material separation and ERPII or much deeper separation including nonferrous metals and plastics. The facility also handles end-of-life recycling and refurbishing. Durham is also now home to TriangleEcycling, a related social enterprise based in Downtown Durham. It provides services for small to midsized businesses and organizations by employing off-duty firefighters for pickup and disassembly of electronics which are then wiped down to remove secure data before being broken down and transported via TROSA for further processing at the Durham GEEP facility with 10% of the profits going to Durham Public Schools to support sustainability education. Based on EPA estimates, Durham residents probably discard 414 tons of electronics each year with 68% stockpiling the unwanted equipment in their homes because it isn’t yet accepted in curbside recycling. As a stop-gap, special collection events intercept and keep 14% to 18% or 75 tons out of the landfill which is where much of the remainder will eventually end up. While residential curbside recycling isn’t cheap, it will ultimately be a far less expensive and far more effective and reliable way to keep electronics from polluting the landfill. It's nice to know that when the City of Durham is ready to move beyond special-event collections of e-waste to using curbside collection to capture and recycle the remaining 340 tons of electronics each year, the City will be able to process them at local businesses while contributing to causes such as Durham Public Schools and TROSA at the same time. Seems like a win-win-win to me! Perhaps people in the workplace or in the course of civic affairs who take questions as criticism are not as great an impediment as are those people who are afraid or reticent or slow to ask questions – usually as much out of fear of not looking smart as for fear of looking stupid. Designed for the classroom, the app which is entitled GoSoapBox enables students to raise anonymous questions to their teacher but it would work just as well for workplace staff meetings and even for meetings outside the office. Unfortunately it will only be a nuisance for people who invite others to hear a pitch, but seed the meeting with people who have committed to the proposal in advance as a means to pressure those who are hearing it for the first time or to drown out any concerns or objections. It may even work for public hearings and other meetings that are televised or webcast meetings as a means for residents who can’t attend to voice opinions or raise questions they would like officials to ask of presenters. Whenever several verbose members dominate exchanges by frenetically leaping from point to point before there is time to pose questions to the commentators or probe for supporting data or rationale, often prematurely “calling for the question” as an intimidation tactic. Where emphatic commentators send verbal signals or use body language designed to intimidate a “who’s asking” compliance based on cronyism or powerful relationships and not the merit of the issue under discussion. Whenever a few members use verbal forcefulness, condescension or patronization to virtually shout down consideration of questions and concerns with which they or often their outside special interests disagree before discussion can inform a decision. When board members are annoyed by another member who openly fronts for special interests or openly violates ethics or cycles discussions back to old issues but are too embarrassed for the individual to intervene because that board member’s comments or questions really are that uninformed or stupid or, perhaps, they fear retribution. This GoSoapBox app provides a tool for secret ballots and/or, at the very least, can equip moderators with information to better able them to guide the discussion or even to pose hypothetical questions that are not being openly raised. My More Genuine Connection To Outlaws! Long before I literally bumped into Robert Redford in a shoebox-sized store dedicated solely to selling country-western apparel/boots on the road between Provo and Springville, Utah in 1971, my family history included a connection with the real Butch Cassidy and Sundance Kid. I wasn't aware of this bit of family history when a couple of years before I had seen the Oscar-winning movie starring Redford and fellow actor Paul Newman. I was familiar with the story of Redford's connection to that area where I went to college along the Orem Bench that runs along the Wasatch Range of the Rocky Mountains. While I was in college Redford had purchased a circa 1944 rope-tow ski area named Timp Haven on the other side of Provo and christened it Sundance after his character in the movie and now also the namesake of the famed Institute and festival he co-founded. I thought until recently that my maternal grandfather’s fascination with the real Butch Cassidy and Sundance Kid was because of the famous movie or because he was always an avid student of the history of the settlement of the Intermountain West. I knew my great-grandfather, George Frederick White, had been a stagecoach driver in northern Nevada on the route from the railhead at Wells south to the silver mines at Cherry Creek and back as he convalesced with so-called sedentary work from a bout of typhoid fever he had caught in the late 1890s while working as a cowboy and foreman on the now historic and continuously-operating 71 Ranch then part of the original Halleck Land and Cattle Company in the shadow of the Ruby Mountains near Deeth. While my great-grandmother Eleanor operated the stage line station in Wells, my great-grandfather would drive the stagecoach, probably on contract with Wells Fargo to carry mail, freight and passengers, down the Ruby Valley along what is now US 93, overnight in Cherry Creek, and then drive the return route the next day. Now a ghost town, Cherry Creek is coincidentally just five miles off the Pony Express/Central Overland Mail Route that a great-great grandfather on another maternal line had guarded from Shoshone Indian attacks as a Union Army Cavalry Trooper thirty years earlier during the Civil War. Today the old ghost town is an hour’s drive north off US Route 50, “The Loneliest Highway In America” and the first to traverse the continent. According to memoirs my great-grandfather White was probably driving a Studebaker Mountain Spring model, rather than the earlier Concord stagecoach used in most movies. It would have been similar to the one at this link with canvas sides that could be dropped down when needed and it may have been pulled by teams of huge Shire heavy-draught horses bred from stock that his 71 Ranch’s owners had imported from England along with Hereford cattle a couple of decades earlier. But I wasn't aware until recently that a few years later my great-grandfather also drove stagecoach on the route through the 40-mile-long and petroglyph-rich Nine Mile Canyon to and from the US Cavalry Fort Duchesne near that nook carved out of Northeast Utah for Wyoming and Colorado. At the time the route was regularly used by Butch Cassidy (Robert LeRoy Parker), the Sundance Kid (Harry Longabaugh) and their gang of outlaws known as the Wild Bunch to transfer stolen horses between hideouts in Wyoming and Utah. 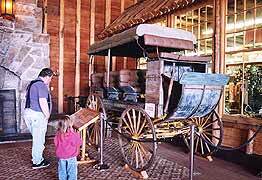 Some of the outlaws even worked at the time on a ranch along the route. Had I known sooner I would've taken a detour along that same route just a year ago this month when I passed its railhead of Price, Utah as Mugsy, my English Bulldog, and I drove up from the incredible Arches region of that state on a segment of what would be a 6,000 mile cross-country trip to visit my daughter and grandsons and sisters and mom, the 83-year-old granddaughter of George F. White and Eleanor Harper. While one of my great-grandfathers was driving stagecoach another maternal great-grandfather was a sharpshooter riding atop railcars filled with gold from the mine at Mercur and one of my paternal great-grandfathers was homesteading ranches in the shadow of the Tetons near Yellowstone. I didn’t grow up to be a cowboy although I was sometimes accused of being one when I ran community destination marketing organizations over a 40 year period. Maybe that apple didn't fall too far from the tree after all! But by now you know it really is in my DNA, and maybe through family historical vignettes such as this my grandsons will continue to appreciate the people who are part of theirs. Regardless of where a person works, whether in the private, public or nonprofit sector, one of the challenges of management is to help people understand the need for continuing and never-ending improvement. Far too many people seem to want to go on autopilot and view any questioning of the status quo as personal criticism. Far too few seem to accept that if a project or product is successful, a measure of that success will be the need for continuing and never-ending improvement. 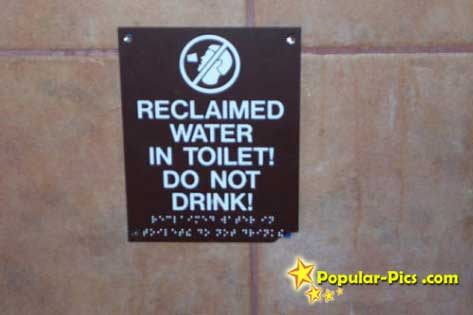 Take recycling, for example. Nationwide, twice as many Americans are recycling today compared to the percentage of people who did so two decades ago. The national average in 2011 was 58%, which is about what it was in Durham, where I live before we recently adopted 95 gallon rollout recycling containers. Now the percentage here is closer to 85% or 90%, although the transition took a lot of work and I'm sure there was plenty of resistance from the “if it ain't broke” types who thought those little carry-out totes worked just fine. When we observe such success, it is natural to wonder when will more things be recyclable? We also wonder when will we have the choice to downsize to one of smaller rollout waste containers (a process known as reverse recycling) that are available in many other communities, even if phased in gradually for new move-ins or as replacements for any that are broken during pickup which judging from my street alone must not be all that infrequent? Those questions may feel like criticism to people who worked so hard just to get it to this point but they really shouldn't be construed that way. They are the natural result of being successful. People want to recycle more and throw away less, which was the goal all along. Take small electronic items for example. In Durham the city will swing by and pick up large, bulky items, but residents are asked to hold on to the smaller items and bring them to episodic events for recycling. The events have been a huge success. Residents have queued up at six events over just the past two years and have recycled 149.13 tons of electronics or nearly 300,000 pounds, or about 1.5 pounds for every adult resident city. Impressive it seems and this doesn’t include the tons of electronics that are recycled as trade=ins by retailers such as Staples and Best Buy. But that begs the question as to when residents will be able to just put the small electronics in their recycling rollout cart every other week instead of stockpiling them and then queuing up at special events specially created to collect them. All recycling items go through a sorting stage anyway so even if electrical items are not handled by the same vendor that processes the other recyclables, electronic items could still be placed off to the side in a bin at sorting sites to be picked up by the same vendor that collects them at the special events. Even if it takes a while to reach the level of mass at which this is feasible or to work out the logistics, residents would still be relieved to know that the process is being evaluated and that the two types of collection will eventually merge in the near future making it possible to handle electrical items much more conveniently. The City has done an excellent job of teaching residents to recycle and making it increasingly convenient to do so. To sustain and increase that enthusiasm it is important for residents to be able to envision that more and more things will be recyclable and that there will be recycling containers placed in more and more places, including city parks, airports, schools, etc. Enough will never be enough and the job will never be finished until either everything is conveniently recyclable and there is absolutely no need for land fills or, as is currently under development and full-scale testing, new processes are scaled up to convert all un-recyclable waste into energy. Until then questions should be taken as suggestions rather than criticism. Questions are a sign that people are engaged in the objective of continuing and never-ending improvement. Click here for related article in Newsweek. Click here for the book upon which it is drawn. Part of what I've always liked about Durham, North Carolina is that while it is a midsize city and the core city for a midsized metro area, it has a small town, Main Street feel. It also seems that too many cities once they go skyscraper become a bit too pretentious or turn into bullies. But I’ve repeatedly kept coming back to the infographic shown below since first seeing it in my November 2011, issue of Wired Magazine. It is a great illustration of the externalities, both positive and negative, that result from land-use decisions. Click on the image for larger view in on this link for the original article. People may be surprised to learn that Durham County where I live, is the only one of North Carolina’s urban counties that is home to one of the state’s Scenic Byways. This is because Durham is not only home to the state’s fifth largest city, which is also the core anchor for a four-county metropolitan area, but it is the 17th smallest land area of the state's 100 counties. Durham even rivals the county where the town of Asheville is located in North Carolina’s mountain region for scenic byways. Little did I know when I was first recruited to Durham in 1989 to jumpstart the community’s official marketing agency that within days I would be sitting next to then-Governor Jim Martin behind plate at a Durham Bulls baseball game in the Historic Durham Athletic Park. Nor did I realize at the time that this Republican governor, only the second since Reconstruction, had just set in motion the development of what would become the state’s award-winning Scenic Byways program. People such as Martin with a PhD in Chemistry have become increasingly rare in the Republican Party, an affiliation claimed by only 6% of today's scientists, 12% counting the portion of political Independents who lean that way. Blinded by the lack of empirical voice and research-based decision-making, members of that party are now trying to eliminate the National Scenic Byways program as well as grants to enhance roadsides. It was a few years after that evening with Governor Martin that I first became acquainted with the name Bill Johnson, who was the State Roadside Environmental Engineer and one of the driving forces in developing and evolving the byways program. As the head of the Durham Convention & Visitors Bureau I had been asked by the then-chair and vice-chair of the Durham County Board of Commissioners to identify and help qualify potential byway routes here. The state accepted two of several potential routes we identified including a spectacular 27 mile loop through the northern part of Durham County including rural parts of the City. We identified another through Duke Forest which was accepted as the terminal segment for the 92-mile Colonial Heritage Byway that begins near the border between Guilford and Rockingham counties, cutting across and up through Caswell County to within view of Hyco Lake along the Person County line before dropping down through Orange County and then over into Durham and through Duke Forest before terminating very near where I live. During his tenure as the state’s roadside executive Bill also had a hand in implementing the beautification of North Carolina's roadways with spectacular beds of wildflowers, an idea spurred by Governor Martin’s wife Dottie. Bill understood research showing that when it comes to maintaining roadsides, removing litter is a short-term inhibitor to littering behavior but coupling it with beautification creates a shared sense of responsibility and a longer term and more sustainable fix. A good friend now, Bill’s retired and lives “down east”, as we call it, where he has a business and does some farming but his passion remains the overall scenic beauty of North Carolina, especially as viewed from the state’s roadways, that is, except where easements to block that scenery as well as clear-cut football-field sized swaths of trees and vegetation on each side have been gratuitously granted to more than 8,000 huge, stationary outdoor billboards. Now also in retirement, it is my honor and privilege to continue to work with Bill in a renewed statewide grassroots effort to preserve, protect and restore the state’s scenic character including what is evident along its roads and highways. 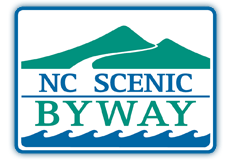 Click on this link for website of North Carolina's Scenic Byways. Using the interactive map shown, select one of the three regions of the state to view the Byways then click on the icon next to a Byway of interest for a pop-up with a brief description and a link for more information. Download a PDF of all of the Byways by clicking this link or use the information on the website to request the booklet. The Much Deeper Source of My Passion For Trees! When I talk or write about trees, I often tend to use aesthetics and economics and research to make the case for conservation and reforestation, but my personal passion and reverence in this regard come from my spirituality and a biblical sense of stewardship. My two major influences could not be more different in many ways. My paternal grandfather had just turned 16 and was already homesteading the Idaho ranch, on which I spent my early years, when Father Thomas was born in Greensboro, North Carolina, about 60 miles west of where I have lived for nearly the last 2 1/2 decades. Both were Christian, my grandfather just a generation removed from Mormon Christian pioneers who fled persecution for the safety of the Rockies and FatherThomas, a scholar and “geologian” as he liked to refer to himself, a member of the Passionist Order Catholic priesthood. With only a second-grade education my rancher-grandfather learned his respect and reverence for conservation as a homesteader with a lifelong reliance on the earth and rivers and forests and animals. Father Thomas earned a PhD and was a prolific author and although he found his voice for conservation late in life it was born of a boyhood epiphany in a North Carolina meadow of his youth. My grandfather had witnessed as he came of age at the end of an intense 60 years of desecration across the nation and the rise of a Republican president determined to steward the nation’s natural resources in the spirit of Thoreau and Muir, the art of Cole and Bierstadt and the work of Olmstead. Father Thomas, whose epiphany occurred in the twilight of that President’s life, was just 56 years old when the nation formed an agency in the 1970s under another Republican president dedicated to safeguard the environment. What must Father Thomas think, if he is looking down today, as that same party appears bent on disabling that progress? My grandfather passed away just as I started to turn the age he was when he first homesteaded in the very northeast tip of the Yellowstone-Teton nook of Idaho, but it seems his spirit is always nearby even as I pass the age he was when he passed. Just a few years after I arrived in North Carolina, Thomas Berry returned to this state and the place of his birth to live out his final years. It is here, at the dawn of the century, that he wrote The Great Work- Our Way Into The Future which is my favorite of his books. “While we have more scientific knowledge of the universe than any people ever had, it is not the type of knowledge that leads to an intimate presence within a meaningful universe… The world of human meaning is no longer coordinated with the meaning of our surroundings. I too have faith that the generations of my daughter, my two grandsons and their children and grandchildren will take up the challenge offered by Father Thomas and that the overreaching symbolized by the current giveaway to the outdoor billboard industry will ultimately backfire and lead to not only a repeal of that legislation, but in the end to a statewide ban of all outdoor billboards in North Carolina, such as is already in effect in other scenic states such as Alaska, Hawaii, Vermont and Maine. I owe the fact that I have retained my sense of spirituality outside the bounds of any organized religion and that this same spirituality includes a reverence for nature to influences such as my grandfather and Father Thomas, who passed away in nearby Greensboro at age 94 in 2009. I wish I had taken the opportunity while they were living to tell each of these very different people how much their influence has meant to me but I am dedicated in their memory to making sure their sense of reverence and commitment and respect for nature is passed along to my grandsons as it has been to my daughter. Some people may have tuned out upon reading in the local Durham newspaper recently that STEM, the model that Southern High School will transition to that model next year, refers to education in science, technology, engineering and math. A few may have connected the dots to a report delivered this month to President Obama which recommends that the nation produce 1 million additional college degrees in those areas. The proposal may be destined for partisan gridlock, however, given that only 6% of scientists affiliate with the Republican Party according to a Pew study Which also reports that nearly a third of scientists are political Independents. More than half of all scientists affiliate with the Democratic Party. Of the third who are Independents, 6% of those lean Republican, while 81% lean Democrat. It is clear that as the Republican Party has increasingly moved to the far right, it is shedding not only moderates but scientists as well, leaving it in an echo chamber of confirmation bias with little or no empirical voice. Ideologically 9% of scientists are conservative, 35% are moderate and 52% are liberal. As the Republican Party becomes increasingly ultraconservative and white and male, it is easy to understand why the Gallup Poll found that 29.6% of that group are “climate change deniers” compared to just 7.4% of all adults. But many who read about the change occurring at Southern High here in Durham may have failed to noticed that the four specialized academies at the redesigned school will include include one called the School of Business Management and Sustainability. It is fitting that Kenneth Barnes is the principal at Southern. Kenneth was in management when I first met him and became friends nearly 2 1/2 decades. At the time he worked at a Durham company that manufactured test tubes among other things. Before finding her passion in community relations for the local television station, his wife Monica and I worked together at the time to jumpstart Durham's official community-destination marketing organization. When the company close the facility, Kenneth lost his job and seemed to lose his way for a while. I saw Kenneth frequently as he tried his hand as an entrepreneur in a business somewhat related to farming an area close to his heart from when he grew up down east. Then Kenneth zeroed in on his true passion. He returned to school and added a teaching certificate to his bachelors degree in business administration. He became a great math teacher while earning his master’s degree in school administration. He was a doctorate candidate the last time our paths crossed a few years ago. Kenneth has a perfect blend of backgrounds to lead SHS in this transformation. He will definitely understands the importance of business management as part of a career in STEM areas. I just wish he and his program could have been around to have an influence on those Americans who seem so estranged from science today as adults. My grandfather treated me to pecan and peanut rolls almost as often as I like to feed my English Bulldog “Greenies” for dental cleaning. I inhaled glazed donuts whenever they were available and my favorite salad was fruit covered with my mom’s incredible homemade whip cream. In the years immediately after I left home, breakfast consisted of a Coke or Pepsi and a hostess berry pie on the go and I was often fueled by strawberry twizzlers during periodic trips back home. Then I hit the wall in my early 20s. I was diagnosed with “reactive” hypoglycemia (not diabetes) and I've had very little sugar in the nearly 40 years since. I've been a high-protein-low-carb diet ever since and it sure works for me, although more exercise wouldn’t hurt. If you aren't “fortunate” enough to have learned this information through a diagnosis of reactive hypoglycemia or something similar, the great new infographic at this link by Massive Health illustrates in 12 simple steps just how sugar, even just the thought of it, leads to increased body weight and a world where currently 7 out of 10 adult Americans are overweight or obese. When I read a piece published earlier this month in the weekly science journal Nature, I had no problems at all understanding why scientists are calling for the regulation of sugar much as we do alcohol and tobacco. Although politically “red” states and areas have the largest amount of overweight people (I'm not sure where political independents like me fall,) a very cool thing has been happening while ultraconservatives have been busy grid locking and effectively starving government. Enlightened by government information and ignited by consumer awareness, businesses including large corporations have been forging ahead with sustainability initiatives including examples such as Thomas Built, a zero waste-to-landfill school bus manufacturer here in North Carolina and a move toward carbon footprint transparency by many businesses that have learned that this can bump stock values. Now we’re also seeing moves by some grocery chains, including the the largest, Walmart, which made an announcement last week that it will implement “Great For You” designations labeling healthy foods to better inform consumers. Judging by the standards Walmart published it seems like more than a marketing scheme. But while it may indeed just be part of a strategy to turn around negative public opinion and it is obviously a voluntary move toward better business practices, it in no way compensates for some of the negative things the retail giant is doing to the food system in general. Marketing has always been more effective when it says “look here” versus “don't look there,” although it is widely recognized that negative information is always many times more powerful than positive information, especially as we currently see in politics. That's why, until marketing gets a whole lot more ethical than it has become to date, there'll always be an important role for government regulations in the public interest. Refined sugar and refined carbohydrates, which rapidly break down into sugars once eaten, are still a legitimate issue for government regulation in its important role of safeguarding public health, especially since the free market alone fails to incorporate “negative externalities” into the prices for these commodities. Primarily it is promotion and consumption of sugars that is driving the spectacular increase of some very serious diseases such as diabetes, which are having and will continue to have an impact on the economy that will make the current obsession with the federal deficit pale by comparison. I'm very lucky! My life and my health at age 63 would definitely be much different had I not developed a very physical aversion to sugar so early in life and for that I’m most fortunate although I still cherish fond memories of my mom’s cinnamon rolls. Looking at it through a market-driven lens, one could wonder why, when Durham's reservoirs are completely full, as occurred last week, and water is flowing over the dam to downstream communities, the rates paid for water here don't adjust to zero. Several years ago in reaction to a drought Durham, North Carolina, where I live implemented a pretty steep tiered system for the rates it charges for water, applying some free-market strategies to the use of this critical resource. But of course the price we pay for water is not driven only by the status of supply. Rates need to take into consideration the infrastructure required not only to collect the water, but to treat and distribute and then reclaim it which, using market principles should also be factored in. Even so I still doubt we’re coming even close to paying the true value of this resource. I wondered about all of this as I read a recent news article entitled in part “Yuck Factor Subsidies.” The article is about cities in various parts of the country that are using some pretty old technology to make reclaimed water clean enough to route back into the drinking water supply and/or to recharge groundwater. The so-called “yuck factor” is a term coined by bioethicist Arthur Caplan “to describe the influence of instinctive responses against new technology.” It goes beyond what my youngest sister meant when, as a little girl, she wouldn’t drink what she called “bathroom water” from the tap in that room in our house as we were growing up. According to the article in the New York Times, the reclaimed water that cities are routing back to the tap is much safer than the water from most private wells. Hopefully part of the increased fees we are paying for water now, even when the supply is larger than what can be contained, will help speed up funding for and accelerate the pilot reclamation project noted in the Durham Comprehensive Plan under Chapter 9.3.2. and that is retained in the current draft update as of this week. After reading the news article about how other cities are already doing it, I am hoping that we give a higher priority to our pilot project here in Durham and that it will take us in the same direction and that other locales are headed, and that we too will overcome any “yuck factor” here. Of course the draft update of the Durham Comprehensive Plan still intends to increase Durham's water supply by such things as building a higher dam to increase the depth and size of Lake Michie as well as pursuing the option of obtaining water from Kerr Lake. Hopefully, though, Durham officials will place a lot more emphasis on reclaiming the water we use as the means to increase supply! To see the full image click on the infographic below or on this link. Cick on image below or this link for full infographic! Just One Person Removed From Mitt! While not the 33,000 enrollment it has today, Brigham Young University had a large student body even back when I attended. So I suspected it was a long shot when I got a call from a Washington Post reporter asking me for my recollections of Republican presidential hopeful Mitt Romney. Before I could jump to the conclusion that maybe someone does read this blog, a quick online search while we were talking confirmed that Mr. Romney and I were separated only by the name of my best friend, the late Bob Cardon in the 1971 BYU Yearbook listing of members of the Cougar Club, athletic booster group. Mitt was president and the club wasn't large back then, but we had special seating together during games so I suspect we knew one another although more than forty years later I have no recollection of any member except Bob. All I could recall for the reporter was that both BYU and the Rocky Mountain West were certainly a lot more ideologically diverse back then than they seem to be today. However, we were all united even then by the desire to beat Utah, a rivalry every bit as intense as Duke, located where I live now, and nearby Carolina! The call brought back a flood of memories of Bob who moved to the mid-Atlantic South nearly two decades before I would when he landed a job in Washington DC at one of the big accounting firms after graduation. Bob flew up to join me during my first visit to New York City, a business trip in 1976, during which Tom Lucas, another friend from law school, who was studying tax at NYU, snapped a photo that is now haunting reminder of the World Trade Towers. Bob and I stayed in touch, which was a bit unusual for either of us when it came to friends we left behind. We first became acquainted year or two before I was married and I remember waking up in the wee hours each morning to the sound of Bob playing songs by The Ventures on his acoustic Gibson guitar in our shower where he could replicate the reverberations on songs such as Apache. The next year he was a frequent visitor to our apartment on Center Street in Provo the site of an indelible memory of when he and I first heard the hit song Joy To The World by Three Dog Night on the radio. Shortly after I was recruited to Durham in 1989, where I still live, Bob was diagnosed with cancer in the bone of one of his legs. He fought the disease valiantly, including trips abroad for experimental treatments and then one day I received a call from his wife that he had lost that battle. I still miss him and if he were alive I’d bet (but not $10,000) that he would remember Mitt. I may have been part of the reason that net income fell 58% at Amazon.com in the fourth quarter of 2011. I decided to become part of the 56% of US consumers who try to only buy products from brands that do good things for the environment or community. According to the research conducted last year, Amazon will face even more scrutiny in China, where that percentage zooms to 83%. In fact, I became part of the 40% of consumers who go even further and stop buying from that brand compared to 20% who do, about the same percentage who tell others not to boy. I may also be part of the reason that local independent retailers across the nation outperformed the national average in holiday sales this past year. It was hard not to keep rewarding Amazon for its incredible innovations. I had hoped that Amazon would eventually do the right thing. But that inventiveness, built on a platform that was researched and developed by public tax dollars, will never outweigh the company’s hypocrisy in refusing to pay local tax revenues while it desecrates local business climates. I just don't buy Amazon's claim that it is refusing to pay local taxes because it is inconvenient or unconstitutional while hoping that instead a uniform tax will be enacted nationwide. Any national retailer can tell you a simple today’s easily available databases make it for them to localize each purchase both to where the consumer lives and related jurisdictions. In free-market terms I would call this the mother of all negative externalities, meaning that Amazon is benefiting by neglecting to include the true cost (including negative impacts) of its products and services and is further amplifying those hidden costs by spending tens of millions of dollars fighting any effort toward what economists call corrected pricing. I don't expect my gradual withdrawal will bring Amazon to its knees. I began by forgoing any use of my Kindle or the related apps I had begun using instead a couple of years ago on my smartphone and tablet. I buy the e-books via the website for my favorite local bookstore, which happens to be The Regulator Bookshop located on Ninth Street in Durham, North Carolina, where I live, and the books download into my IndieBound app just as they did in the Kindle app. You can find the participating local bookstores near where you live by going to this link. My switch is not just symbolic. A much greater proportion of each dollar stays in my community where local businesses create jobs for my neighbors and reinvest taxes in my community. It is also better for the environment because it involves less packaging, less transportation and an overall smaller carbon footprint. I'm sure Amazon means well and its founder is sincere in his beliefs, but that doesn't compensate for the company’s hypocrisy or the fact that no amount of good can ever compensate for the vast amount of harm it is creating to states and especially to communities. The free market is a marvelous thing but let's face it, the reason we have what is called a mixed economy is to make adjustments for what the free market won't, doesn't or can't do rapidly enough. If it could or did, either the products sold on Amazon would be unaffordable or the company would be paying it's fair share of taxes. To support independent retailers search online for a similar movement in your community like Sustain A Bull in Durham. Communities such as Durham, with innovation intertwined deep in their DNA, can, like humans, also suffer from attention deficit. When I observe this, it reminds me of how an organizational behavior consultant helped me understand a trait that was inhibiting the success of one of my staff members in an organization I managed in another city nearly 30 years ago. An organizational psychologist from RHR, a management consulting firm, helped me understand that a staff member of mine did not carry knowledge, experience or learning from one project to another as I wanted because he viewed each project as a silo. Sometimes innovative communities suffer from what looks like attention deficit because they never seem to fully exploit the success of a project by populating it to the entire community and instead leave them stored or “siloed” while they hurry on to the next panacea usually accompanied by some related matching grant. Neglect of roadsides and medians is actually one of only two areas where Durham's internal stakeholders give the community overall a negative rating in scientific surveys. The other negative-to-positive ratio is for street signage and wayfinding. Communitywide wayfinding was first proposed to the community in the mid-90s. Impatient for officials to grasp a more holistic approach, and to his credit, the head of Durham's downtown advocacy organization and a friend successfully pushed wayfinding into a plan to update street amenities in one of his downtown neighborhood’s five districts. It has slowly been populated to the other four but not communitywide where it is the most needed. But as successful as wayfinding has been in that one tiny geographic area and as inexpensive as it would be now to populate throughout the city and county, community leaders have left it siloed there while other communities in this state and across the nation have leapfrogged them to a countywide approach. One can speculate on the reason why communities silo projects. Often there is a lack of an overarching strategic direction. Instead, officials seem to become addicted to anger-fueled adrenaline fixes or grant-chasing and neglect to grasp that something successfully implemented in one area can be extended even more cost effectively to have an even greater effect communitywide. As has been incorrectly surmised about roadway neglect, one might expect that negative resident opinion scores on Durham’s street signage and wayfinding might be driven by newcomers, especially because Durham is rated so highly and consistently as a place to live, work and to business as well as visit. But that isn't the case. While residents who have lived here three years or less give street signs/wayfinding a 3 to 1 negative to positive ratio with nearly 40% unsure, the percentage of residents who have been here 11 to 20 years show an increased negative rating up from 45% to nearly 60% and less than 25% are unsure. Communities such as Durham with a highly irregular road pattern, a terrain of never-ending hills and dales and a heavy tree canopy, but with no singular defining features such as a broad river or mountains, are in desperate need of a coherent communitywide system of wayfinding signs that will also simultaneously eliminate up to half of existing sign clutter. There are few if any other improvements that will make such a dramatic impact on the day-to-day lives of people who live in a community or commute to work or travel here to visit than coherent communitywide wayfinding. For Durham the hard part has already been done. Taking a solution that has already been show to be successful in one neighborhood and extending it throughout the community as a whole does not have to be as complex as noted last week by Emily Badger in Atlantic Cities. And as my friend and fellow blogger Bill Baker recommended when he guided me to Badger’s post, Durham's need for communitywide wayfinding has already been identified in what he calls visitor readiness reports by Durham's official community-destination marketing organization as a top priority for increasing Durham's visitor-centric cultural and economic development. For officials this means that populating Durham's wayfinding across the community will be self-funded by the growth it helps spawn to the nearly $40,000,000 that visitor spending generates each year in local tax revenues that are then split by the City and County. This includes the nearly $4 million in City and County general funds that is clearly eligible to be used to fund wayfinding under North Carolina General Assembly guidelines for local use of revenues from a special tax paid by overnight visitors. It Isn't Only Government That Moves Slowly! It will be exciting to see how entrepreneurs and local and state governments will soon make use of the drones, if the timelines stick as outlined in the FAA funding legislation which is expected to be approved this month. 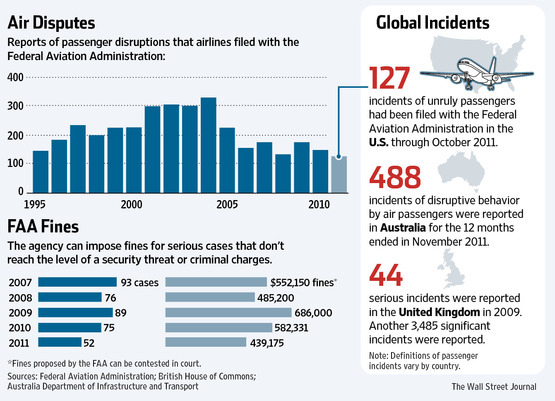 Of course, the knee-jerk reaction that the FAA is moving too fast was to be expected. Drones, a.k.a. UAVs (unmanned aerial vehicles) have been under development since 1915 or so and developed largely with research funded by the US military and Israel. So everyone's theoretically had plenty of time to make adjustments for this not-so-new technology. Inertial reactions to new technology are always a bit baffling or some would say amusing as in the resistance here in Durham among some neighborhood associations who fear leaving the one-dimensional listserves to which many have become accustomed since the mid-to-late 1990s for the multi-dimensional platforms now available such as Neighborship, created by Durham entrepreneur. Of course there was this same resistance to listserves back when they came along. Thank goodness neighborhood leaders at that time had the faith to move to new ways to communicate rather than staying stuck in something familiar “until there was a guarantee” that no one would stay or be left behind. This is the same reticence that keeps nearly every contemporary office holding onto to a seldom used fax machine in the back room just as many still had mimeograph machines and telexes from the 1960s through the 1980s, even though they were rarely, if ever, utilized. In the same FAA bill that timelines domestic use for drones there is a plan to move airlines to the use of GPS technology for navigation similar to the navigation systems in automobiles and trucks and now even being used by 37% of the half of the population now using smartphones. The question again is why, nearly two decades after the technology was introduced in production cars and even rental cars, the airlines are claiming that they haven't had enough time to prepare? The fact is they have had plenty of time to prepare but maybe like some of the wary neighborhood associations they had convinced themselves wait. Some organizations will forge ahead using this innovation but rarely will it be through groupthink! Corporate spin-offs are complex so at first I wondered if Time Warner Cable had shed the core value for sustainability held by its former parent company. But given its “go green” “going greener” and “think green” marketing campaigns, maybe it’s just that the marketing department exempts itself when it comes to hypocritically proliferating huge, stationary and archaic outdoor billboards in my adopted hometown and state. More than 80% of North Carolinians including nearly 90% of political Independents like me (half of all voters,) object to letting billboard companies cut down any more trees especially after the industry reneged last year on a compromise agreement made in the year 2000 with environmental interests, NCDOT and Federal Highway Administration that increased the then-125’ foot rectangular selective cutting zone permitted around billboards to a 250"’ triangular zone with no net loss of trees. Now with the help of allies in the State legislature, the outdoor billboard industry rammed through approval that unbeknownst to many of those who voted for it will now permit outboard billboard companies to clear-cut the size of a Super Bowl football field in each direction along roadsides adjacent to each of the state’s more than 8,000 billboards, all of this over the objections of 80% of North Carolinians. Billboard advertisers, such as Time Warner Cable, may see this as only a risk to the reputation of the billboard companies but marketing experts have long confirmed that the liabilities of using billboards accrue primarily to the reputations of brands that place messages on them. Cable companies aren't immune just because they operate much like monopolies. New research conducted a few months ago reveals that 56% of Americans try to buy from companies that do good things for the environment and that a disconnect between a brand and its actions triggers a negative reaction including conscious decisions not to purchase a particular product or service among 40% of consumers, twice the proportion who continue to buy regardless of the disconnect. 11 percent are considering doing so because they can watch almost all of their favorite shows online. Having watched how quickly tethered telephone infrastructure was left stranded by cell phones, I doubt cable executives are sleeping too soundly at night having lost or in the process of losing more than a third of subscribers during the brief existence of online streaming let alone the risk of losing another 40% just because their marketers are insensitive to their own corporate sustainability vows. Unfortunately, far too few marketing executives in any sector are being held accountable for the alienation of potential and existing customers resulting from their use of anti-sustainability mediums such as outdoor billboards. The time is long overdue for the implementation of metrics that hold marketers accountable for the “net” effect of marketing strategies. This need for accountability also pertains to any community or state destination marketers who continue to use outdoor billboards even when donated, hoping to reach the 1 or 2 people out of every 10 who may use them, while alienating the 8 of 10 they offend. The same is true of all non-profits. they must realize that, get there using billboards, they are alienating many times more potential donors or attendees than they are reaching. Ignoring these facts is not called marketing. It is called stupid. Dating back to pioneers from the era of the real “Mad Men,” and marketing giants (including advertising) such as David Ogilvy and Howard Gossage have discouraged use of outdoor billboards and cited their detrimental effects. If you are a mayor or city manager or governor or secretary or DMO chair of a community or state and your destination marketing organization still uses outdoor billboards you need to give them a “Gibbs slap” up the back of the head. Understanding how viewers of the Super Bowl perceive those incredibly expensive television advertisements that run during each game may provide a glimpse into why advertising of any kind has now become counterproductive based on the annual survey by BIGinsight.com. Three out of four viewers consider Super Bowl ads merely as entertainment which may mean they capture more attention than the 6.5 second average viewers pay to any advertisement. But, based on five year averages, nearly 2 out of every 10 viewers would prefer that advertisers save their money and pass the savings along to consumers; and more than four out of every 10 viewers consider the ads as either a bother, an interruption or something that merely makes the game take too long. An average of 7.8% viewers say the ads influenced them to buy products from the advertisers. That's not a bad percentage until you realize that for every viewer the advertisers are motivating to do what the ads are meant to accomplish, they are turning off three others. The very purpose of any advertising ($3.5 million per 30 second ad during the Super Bowl) is negated when it turns off more people than it turns on. There are far too many other elements of marketing these day, such as earned media which is sometimes called publicity, that don't run this risk; and this is the premise behind an excellent book entitled The Fall of Advertising and the Rise of PR. Still, at a 3 to 1 turn off-to-turn-on ratio the television ads during the Super Bowl are much less damaging to a brand than advertising put up on huge stationary outdoor roadside billboards which, in North Carolina, actually turn off eight drivers/passengers for every one person who finds them useful. When an organization or business goes to the trouble of placing one of the 5,000 ads now viewed by the average person in a day, the objective, at the very minimum, is to motivate consumers without creating enemies for product, service or brand. Owners of advertising mediums such as television or outdoor billboards are typically not motivated to explain this risk to potential advertisers because the negative ratio of consumers they might motivate to consumers they turn off accrues only to the business or organization placing the advertisement. With the exception of outdoor advertising, where the message is the only content, most of us rely on advertising to subsidize news, sports and entertainment. Increasingly, though, there are successful models built on giving consumers the option of paying a small fee to avoid advertising as I just did on Pandora.com. This raises the question about whatever happened to cable television? When I first learned about it in the mid-1970s it was promoted as a subscription-to-view medium free of the constant ad interruptions on broadcast television, but apparently greed quickly made that unique selling proposition extinct. Now that they are losing several hundred thousand subscribers each quarter to streaming (9% of all subscribers to date with another 11% already considering it,) it may not be long before both broadcast and cable television are extinct. Marketers who incorporate advertising into their blend of marketing activities and the agencies which are often paid to both create and place them as well as the mediums that rely on advertising to subsidize content must somehow work together to find a way to reduce ad clutter which long ago made advertising noticeable only by its absence. A good start would be to retire all roadside billboards in favor of less harmful outdoor substitutes. If they don't, it won't just be outdoor billboards that become obsolete. I'm not part of the 68% of adults in the US who are overweight or obese, but in the past, members of my family have struggled with weight. I probably would have too, by now, except that in my early 20s I learned that I am hypoglycemic (reactive not diabetic) and swore off eating or drinking anything that had more than two or three grams of sugar including refined carbohydrates. Don't get me wrong, I'm no paragon of fitness, but when it comes to weight I'm only about 11 pounds heavier than I was when I started high school. It just needs to be firmed up and moved around here and there. My reason for blogging recently about the movement Halfsies was motivated more by my concern about food waste and poverty. Oh, good news is that yesterday my surgeon cleared me, even though it will be another 8 months before I know just how much ability I will fully recover but the bones are growing nicely around the 14 screws which anchors a long metal plate running from my wrist down my arm and the nerves in my fingers are coming back. Massive Health intends to help people by giving them access to better data. If you're interested even during the ramp up there is a blog at this link that is extremely useful. I was particularly intrigued by one that was posted earlier this month about portion sizes even before I had learned about Halfsies, a philanthropy model that permits patrons of participating restaurants to order a half portion while contributing the remainder of the full price for a full serving to help those in need. The blog post on “portion distortion” includes a fascinating infographic that illustrates just how portions have increased since the late 1970s to where today's studies show we are actually consuming 30% more. Also included at the bottom the infographic are some handy references about what constitutes the proper serving in some easy ways to regain control. If you are not someone who needs this information, please forward it on to the nearly 7 out of 10 Americans who apparently do.